We recently made and installed a custom vinyl graphic for Action Sales West. As you can see from the photo, they have very vibrant colors for their logo. As this logo decal was installed outside, we used pre-colored vinyl to ensure longevity. Printing a color looks good initially, but especially in the Los Angeles sun, we like to use pre-colored vinyl to prevent fading as long as possible. Pre-colored vinyl comes in many different colors so although it may not match your logo color exactly, we can come very close. 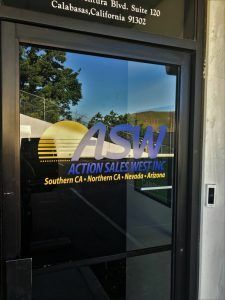 Action Sales West is a full-service candy, snacks and beverage broker with complete coverage across all trade channels in California, Arizona, and Nevada. They have a location right near our shop in Calabasas, California which is where the new sign went. They represent a lot of big names but do not necessarily have many people at the physical location so they didn’t need a permanent building sign. Large, lit up signs like channel letters are great for retail stores and restaurants, but they’re not necessary for every type of location. Window or door graphics are a good way to display information in an affordable way, and without making any changes to the building. Building signs need to be permitted by the city in order to be installed, while vinyl graphics do not in most cases. We do window graphics all the time for businesses that have a lot of storefront window space. Whether you’re just displaying your logo or you want to display graphics related to your business, even one graphic can help improve the exterior of your building. If you’re looking to get some custom graphics for your business, give us a call. Our signs are completely customizable so we can make you graphics that will work perfectly for your business.